Lightly coat large baking sheet with cooking spray. Prepare dressing in small bowl by whisking together oil, vinegar, orange juice, zest, salt and pepper. 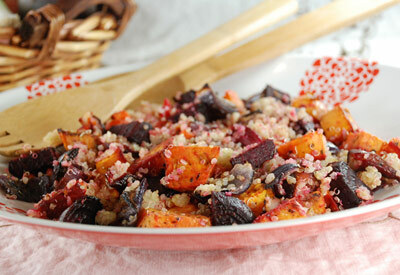 Arrange carrot, beets, leek, sweet potato and onion in single layer on baking sheet. Sprinkle with tarragon. Drizzle 1 1/2 tablespoons of dressing over vegetables. Bake 30 to 35 minutes, stirring occasionally. While vegetables are roasting, rinse quinoa (in fine mesh sieve) under cold running water; drain. In saucepan, place quinoa and 1 cup water; bring to boil. Reduce heat to low and cook, covered for 12 to 15 minutes or until water is absorbed and quinoa is translucent. Transfer to large bowl and let cool. When vegetables are tender, remove from oven and let cool to room temperature. Add vegetables to quinoa. Toss with remaining dressing. Serve immediately or cover and refrigerate. Can be served warm, cold or at room temperature. Quinoa [KEEN-wah] is one of the oldest grains known to man. It is gaining popularity because of its nutritional profile and is considered a complete protein because it contains all eight essential amino acids. Originally used by the Incas, this tiny, bead-shaped grain cooks like rice (taking half the time of regular rice) and expands to four times its original volume with a rich, nutty flavor. Quinoa is gluten-free!